Review: It’s been roughly nine months since the Bionic Commando franchise returned with Bionic Commando Rearmed. Now, Nathan “Rad” Spencer is back, this time in the third dimension. And he can jump! The original game ended with Spencer destroying Project Albatross and returning to be created as a hero. Hitler’s meaty head had exploded, and everything seemed to be peaches and cream for Spencer and the rescued “Super Joe” Gibson. That is, until the “Bionic Purge”. You see, at some point, something went wrong during one of Spencer’s less remarkable missions, and as a result, public opinion shifted strongly against people having bionic implants to replace lost body parts. Somewhere amidst this, Spencer was thrown in jail and was about to be executed, when a pro-bionic terrorist organization destroys a major city. Now, Spencer’s “friend” Super Joe has gotten him out of jail to scope out the destruction. It would’ve helped the story a whole lot if the player was given some indication of what happened to get Spencer thrown in jail, and how Super Joe was involved. It’s hinted at here and there throughout the game, but you never learn any of the details. Whatever it was, it must have been bad because the two characters routinely snarl at each other over their two-way radio as Spencer swings through the ruins of Ascension City. But you know what? Forget all the pathos about Spencer and his missing wife, and the guy who I guess put him in jail, forget all that crap. This game is about one thing, and one thing only: swinging. Spencer’s bionic arm can do some pretty neat tricks, including tossing objects into the air and then punching them at your enemies, but the better part of the game will be spent using it to climb and swing from virtually all parts of the world geometry. At the most basic level, the bionic arm does two things: swinging and climbing. However, the sheer number of ways these two moves can be executed is virtually limitless. With a little practice, you’ll be using that arm to soar across the levels, get the drop on your enemies, and quickly recover in case those first two bits don’t go exactly as planned. The in-game physics will also be helping you out by being a bit... selective. For instance, gravity in the game is more akin to what you’d find on the moon, which gives you a fair amount of time to pull off aerial maneuvers, or just spin around and latch onto the ledge you just fell off of. Also, whilst dangling by your arm from a wall/ledge/flagpole/etc, you’ll find that even the slightest push of the joystick will immediately impart you with the maximum momentum you can achieve by swinging. And if you’ve just attached your bionic arm to the underside of a platform near the edge, you can press a single button to “jump” in a shepherd’s hook pattern up onto said platform. Getting the hang of using the arm is quite rewarding, and the game is forgiving enough with the controls to keep things from getting too frustrating. Occasionally, the “attach” reticule would get a little finicky about where it wanted to put the arm, but the end result would never be more than a minor setback. The one place that you can’t attach your arm, or go at all for that matter, are irradiated areas. As with normal radiation, you can’t see where it is, but the game tries to put some blue fog in the general area. When you get close to such an area, you’ll get a warning. Any closer and you’ll start taking damage from it. I suppose it’s not the worst way to keep the player from straying from the path, but that doesn’t make it any less annoying when you accidentally move into an irradiated area because a swing just barely managed to put you in the death zone. The one thing the game is really missing is variety. During the single player campaign, you’ll be presented with “challenges”, such as pulling off certain combat maneuvers or killing a certain number of bad guys with a single move, which you can complete for health and ammo bonuses, but that’s it. Furthermore, the game allows you to replay past levels, but you can’t complete any challenges or unlock any achievements, so the purpose of this is debatable. The most obvious thing the developers could’ve thrown in for variety would’ve been a time attack mode of some sort. Since so much emphasis is put on quick maneuvering with the arm, this seemed like a slam dunk. The developers could’ve even gone so far as to borrow the challenge room concept from Bionic Commando Rearmed. Again, the idea there is to test the player’s skill with the bionic arm. The game does offer multiplayer, but even this peters out amid the somewhat dull combat. There’s more to the game than the use of the bionic arm, including combat with surprisingly well-trained fodder soldiers, but the emphasis is clearly on swinging, climbing, and getting around. I was able to get into it, but if you’re not keen on the whole thing, this game isn’t going to do a lot for you. It’s a good game, but not “Bionic Commando Rearmed” good. I'm not surprised. The game looks like it doesn't have any of the charm of the original game/Rearmed or the tongue-in-cheek humor of Rearmed. It looks so bland as to make me cry. I don't even know how that's possible considering the same developer (GRIN) made both games. Maybe it had a different team. I'd like to add that this games version of Nathan "Radd" Spencer is one of the worst character designs I've ever seen. There is absolutely nothing appealing about him if you aren't a Faith No More fan (do those people still exist?). They literally could not have done a worse job. One of the games most noteworthy features is that of Mike Patton doing the voice of Rad Spencer. Yeah, he's been doing some voice work lately. Hey, you're right. He's done Metalacolypse, Portal, Left 4 Dead, and some other stuff. Good for him. Patton has done some great voicework as the zombies from L4D and the title character from The Darkness, but he doesn't do quite so well as Spencer. I guess it's partly the fault of the script. The best example of this is when he shrieks out a line after you perform an adrenaline attack. I guess what I'm saying is that maybe Patton should stick to voicing non-human characters. Also, dreads really don't look good on white people. You can get a code form Rearmed to put Spencer in his old outfit with the short red hair, green jacket, and aviators. It just seems kind of generic to me. 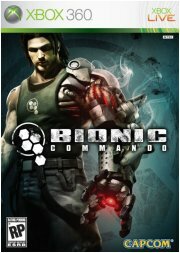 Despite I have never played the Bionic Commando franchise before, reading this review makes me think of the game as something like Assassin's Creed, where one of the aspects that defined the game was, besides killing using stealth, moving around buildings and poles like a parkour practitioner. I also have to mention the repetitive gameplay. The game is surprisingly good, and is a damned faithful game, and in more ways than I originally anticipated. I myself did a lengthy review on Bionic Commando here about a week ago; check it out if you want some more data. The game is damned solid, and worth checking out - if only because we're never going to see another title like Rearmed unless this game does well enough, and that pisses me off. So many of the game's shortcomings stem from the aforementioned time constraints/budget issues, and it shows. Capcom pushed hard for an early release date, and it shows - the game isn't as polished as it could be, wraps up on a cliffhanger. There was a lot that was cut from the game last-minute due to Capcom's repeated budget-slashes and timeframe changes. At the last minute, adding insult to injury, the game's production and advertising budgets were slashed to horrendously low levels. Grin only managed to make up for it with some sneaky and surprisingly subtle product placement. A lot of the game's shortcomings are purportedly scheduled to be fixed with DLC, including new multiplayer maps, and challenge rooms. I pray this is true. On the other hand, Multiplayer is pure chaos and absolutely win. Anyone who tells you otherwise is completely insane. Also, Boogie, no mention whatsoever of the absolutely awesome remixes of the original Bionic Commando's music in the game? It seemed to me there were basically 3 'Climb around and beat the crap out of people' games that have come out in pretty short order. Infamous, Bionic Commando, and Prototype. I ended up picking up Prototype and so far am quite happy with my choice in the matter, maybe I'll come back and check the other two out later. The GBC one was pretty good too. I read that this game only sold 27,000 copies in the first two weeks of release in the U.S.
Can you say "massive flop"? A travesty. The game was infinitely better than RE5 could have hoped to be.